From re-shaping of borders and soil improvements, to full planting plans. We can design & construct a variety of Decking from a simple raised area for your Garden Furniture though to an all inclusive area for entertaining & relaxing. We can also advise and build Arbours, Pergolas and Gazebos. From a simple soak-away and lawn drainage to full rain-water harvesting. We can design & construct Driveways using variety of options including Block Paving, Slabs, Shingle, Tarmac and Resin Bound. We can supply & install Fencing of any style, whether it be Timber, Chainlink or Security. We can also install garden walls using a variety of materials available, whether it's a smart edge for a border or a structural retaining wall. A high quality, flexible and reliable service to suit your every need. Sequoia have many years experience in all aspects of earthworks from site clearance and excavation, to detailed landscape shaping. When you have spent time having your garden re-turfed, it pays to look after it. Irrigation is a simple, cost-effective solution to ensuring your lawn & borders look as good on day 30 as they do on day one. To ensure your lawn stays in tip-top condition, regular mowing is essential and we are happy to provide this service as required throughout the year. 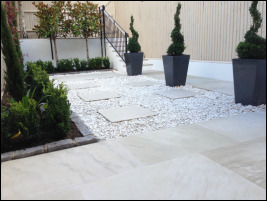 Landscaped Gardens are complimented by installing impressive Lighting emphasising & enhancing features such as trees, buildings, pathways and water features. We have our own qualified electricians who have years of experience in this environment. Mulch is essential for adding nutrients to your soil, inhibiting the growth of weeds and proving a pleasant look to your borders. 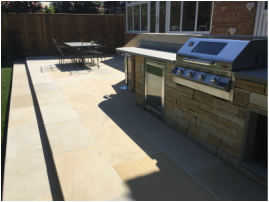 Patios provide your garden with a hardstanding area that can be utilised in all seasons, providing a permanent home for your Garden Furniture, BBQ's and Heaters. Paved Pathways provide the opportunity to enjoy & tend to your garden whatever the weather. Planting comes in many shapes and forms, whether it be a simple raised bed, something more exotic or indeed saplings and mature trees. 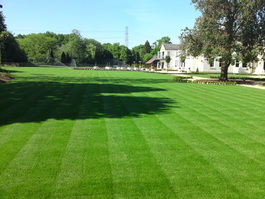 We can supply & lay turf and also seed your existing lawn using only the best commercial products available. We can also advise on lawn care including fertilising, aerating, scarifying, weed & moss control.